BEEKEEPING PRODUCTS | Μέλι Αττική, Αττική Μελισσοκομική Εταιρεία - Αλέξ. Πίττας Α.Ε.Β.Ε. Μέλι Αττική, Αττική Μελισσοκομική Εταιρεία – Αλέξ. Πίττας Α.Ε.Β.Ε. ATTIKI-PITTAS, in the content of improving and further reinforce the beekeeping sector, distributes exclusively the beekeeping products DioFarm and DIO-BEE. DioFarm is a 100% natural premix of bee feed additives. 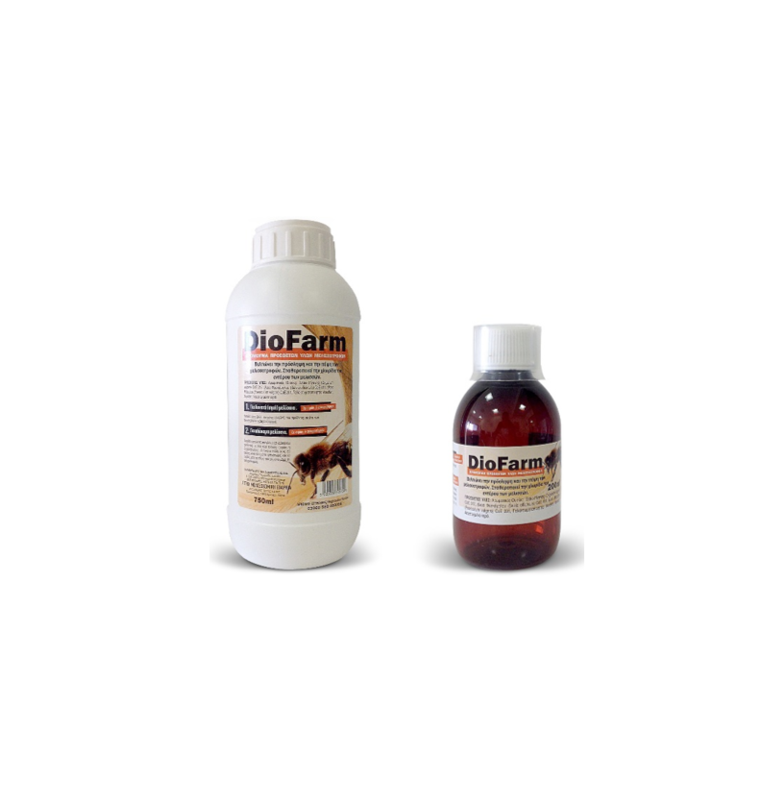 The selling price of DioFarm 200ml is 12.90 € + 13% VAT final price 14,58€ and of 750ml is 44,60€ + 13% VAT final price 50,40€. DIO-BEE is a syrup concentrate with herbal extracts (lemongrass, spearmint, lemon, geranium and melissa extracts) used for swarm luring. The selling price of DIO-BEE (box with 10 pieces) is 7,70 € + 24% VAT final price 9,55€. Either at our shop in Peristeri (Pavlou Mela 29, hours 08:00-14:00, tel: +30 210 5756663). Or in our premises in Kryoneri, Αttica (9 Protomagias str., hours 08:00-14:00, tel: +30 210 5711721). For larger beehives (>10 frames) add 1.5-2.5ml DioFarm in one litre of 1:1 syrup (sugar-water). Apply 1 litre of syrup per beehive, once every 5-7 days, 3-4 applications in total (duration 20-30 days). Add 2 ml DioFarm in 1 kilogram of sugar paste or sugar candy. Give 1 kilogram of bee feed every 15-20 days, from November until March. Apply after fall harvest or early spring before development of the brood. Prepare a solution of 80-100ml DioFarm in 1 litre of water and 2 tablespoons of sugar (40g). Spray 200ml of the solution per beehive (10 frame), once every 5-7 days, for a period of 20-30 days (3-4 applications).